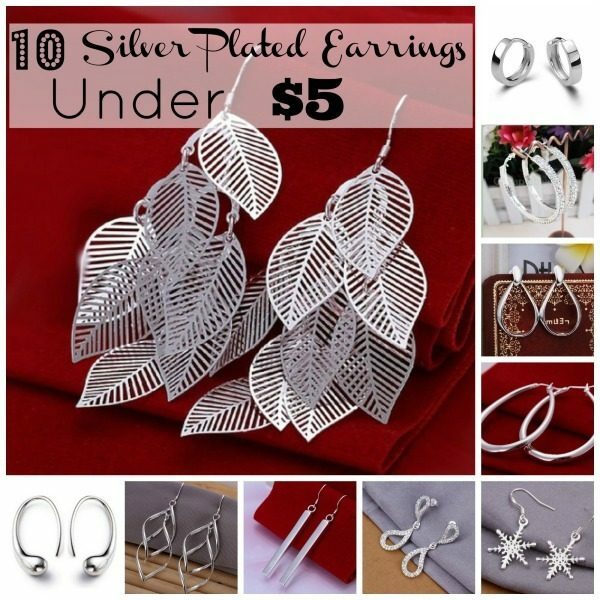 10 Silver Plated Earrings Under $5! You are here: Home / Great Deals / Amazon Deals / 10 Silver Plated Earrings Under $5! Is jewelry on your Christmas shopping list this year? Looking for some fabulous gifts that are also easy on the wallet? You’re in luck – today we have a list of 10 Silver Plated Earrings Under $5 that you can gift to others or treat yourself too without any of the guilt! Silver Plated 2-Row Cubic Zirconia Hoop Earrings – $2.80 + FREE shipping! Silver Plated Korean Style Double Hollow Leaves Earrings – $3.39 + FREE shipping! Silver Plated Leaf Dangle Earings – $3.59 + FREE shipping! Silver Plated Oval Hoop Earrings – $3.60 + FREE shipping! Silver Plated Waterdrop Shape Hoop Earrings – $3.86 + FREE shipping! Silver Plated Snowflake Dangle Earrings – $3.86 + FREE shipping! Silver Plated Long Dangle Earings – $3.89 + FREE shipping! Sterling Silver Plated Hoop Stud Earrings – $4.06 + FREE shipping! Sterling Silver Plated Teardrop Hoop Earrings – $4.33 + FREE shipping! Silver Plated Shining Zircon Bow Knot Earrings – $4.58 + FREE shipping!